This section of the site will serve as an archive for articles written by skirmishers, for skirmishers. These articles will serve to further the knowledge of beginning skirmishers, and to serve as a reference for those who wish to refresh their own memories. 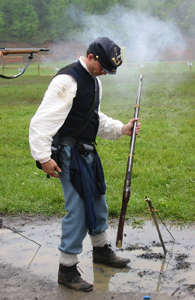 In addition, this section of the site will be host to select links to other web sites thought to be of interest to members of the NWT, and to the wider world of black powder, and Civil War enthusiasts. Please forward any links you wish to add to the list to the webmaster for consideration. The N-SSA publishes a handbook to guide Skirmishers in their N-SSA activities, a condensed version of the Skirmish Rules, with particular emphasis on the basics of safety, uniforms, and the various competitions. To download and print out your own copy, simply click on the above title. It may take some time to download on a slow connection. The Civil War Preservation Trust The Civil War Preservation Trust is America's largest non-profit organization devoted to the preservation of our nation's endangered Civil War battlefields. Selected Civil War Photographs This is the Library of Congress' collection of Civil War Photos. Amazing detail can be viewed by downloading their "Archival .tiff" files and zooming in on the photo in any photo viewing program. Civil War Message Board Portal A link site to many Civil War related message and bulletin boards. Civil War Guns Message Board A message board maintained by several knowledgable skirmishers and other interested parties, specializing in knowledge of Civil War period firearms. American Civil War Shooting Association Skirmishing Organization in Wisconsin. Starline Brass An excellent source for .44-40 Henry Rifle brass and other calibers. Joe's Leather Quality reproduction 18th and 19th century leather accoutrements. The Quartermaster Shop A supplier of reproduction Civil War Uniforms located near Port Huron, Michigan. Arms and Equipment Message board A forum dedicated to topics related to Arms and Equipment carried by the North and South. Jackson Civil War Muster A large annual living history encampment and Civil War Reenactment held in Cascades Park, Jackson, Michigan. Has a very large sutler's row. 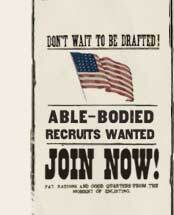 The Authentic Campaigner This site is dedicated truly authentic impression of the American Civil War period. An excellent resource for improving the knowledge of uniforms and equipment. Bluewater Sportsmen's Association Site of our annual skirmish in Port Huron, MI. Detroit Sportsmen's Congress Utica, MI. Lansing Muzzle loading Gun Club Laingsburg, MI. Western Wayne Conservation Club Plymouth, MI. Washtenaw Sportsmen's Club Ann Arbor area.